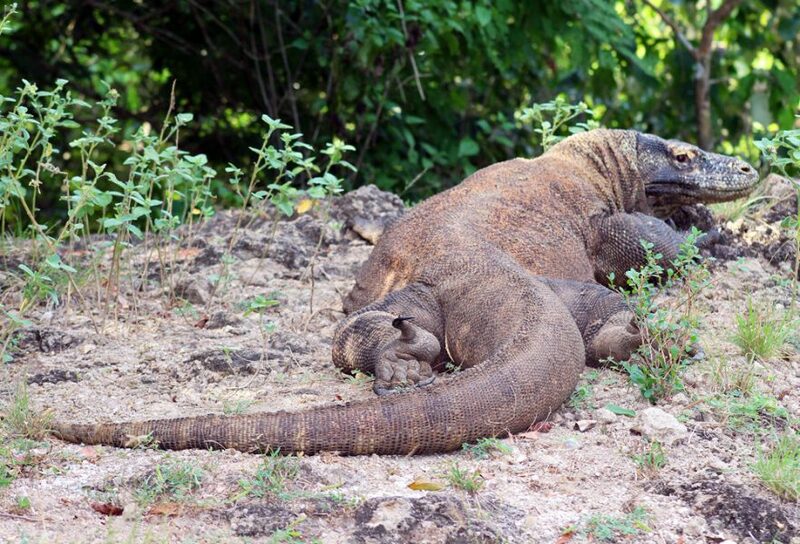 Komodo to Bali – Our Voyage Continues! Continuing the account of our sea voyage from Flores to Bali. We awake anchored off Loh Liang village, Komodo Island. We’re treated to another stunning sunrise over our buffet breakfast, then we’re into the rubber duckies and zooming ashore for another island trek to see the wildlife. 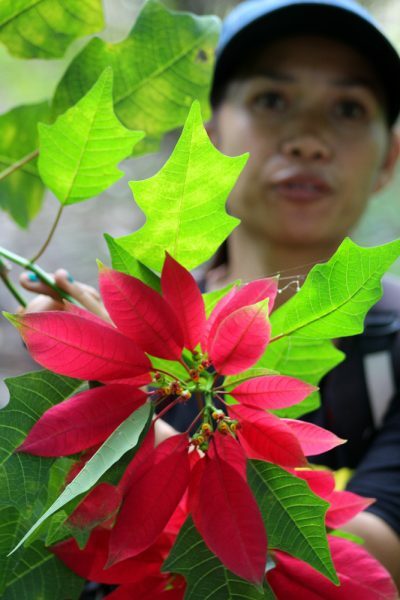 We set out with a guide through scrub and forest. Vegetation here is more lush than the previous island Rinca. We spot a wild boar, warily eyeing a fat dragon close by. Most prey animals are pretty twitchy in these parts, and with good reason. Luckily this dragon appears to be sated and isn’t on the prowl for breakfast. 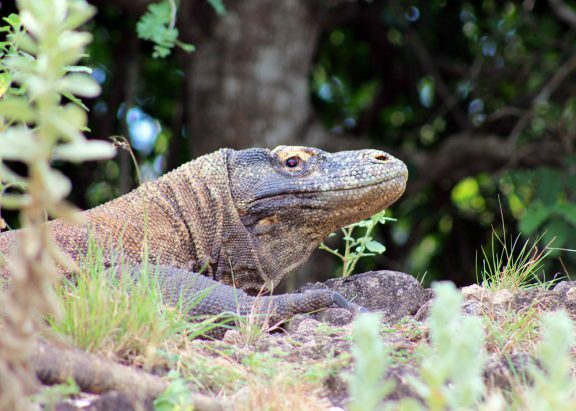 Our eagle-eyed local guide, Rachman, spots a baby dragon sunning itself at the top of a tree. It’s a rare sighting. Young dragons spend their first three years living up trees, feeding on lizards and insects. Here they’re safe from the jaws their cannibalistic elders, too hefty to haul themselves up a trunk. 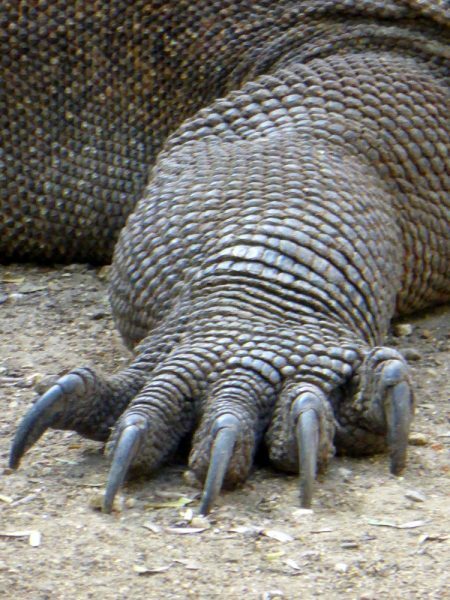 The claw that can tear apart a buffalo. 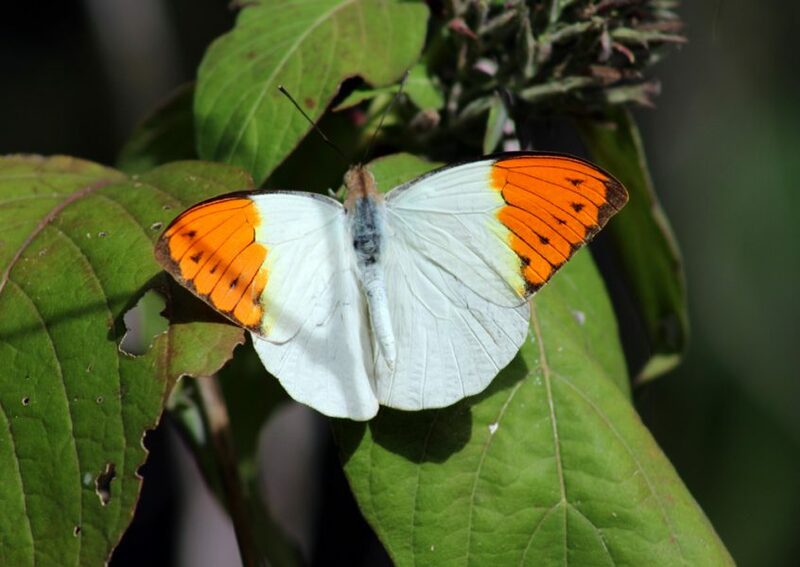 Fellow traveller Mary Taylor won ‘Best Wildlife’ picture for this shot. We’re aghast when Rakman tells us his nine-year-old nephew was killed by a dragon on this very island as recently as 2005. The little boy had gone fishing, then, returning to the village, he paused in the undergrowth answering nature’s call, when a dragon crept up behind him and attacked. On our walk, we see deer, orchids, beautiful butterflies, large tree snails, and a meaty-sized dragon sunning on a rock outcrop. Rachman also points out the spot where, in 1974 Swiss baron, Rudolf Von Reding Biberegg, famously defied orders to stay on the track and with the group. Only the good Baron’s spectacles, a shoe and his Geneva underpants were ever seen again. At walk’s end, back on the beach, we run the customary vendor gauntlet where pearls, T-Shirts, wooden inlaid bowls and shell dishes are being proffered by enterprising villagers. Some fellow passengers grab a keepsake and refreshments. We make a beeline to the boat. Back on deck, we’re soon motoring on to a small island, Gili Lawa, at the north end of Komodo. En route, expert foodie Janet De Neefe is chopping turmeric, chilies, and all manner of exotic local produce. She is joined by Indonesian chef Rahung Nasution. 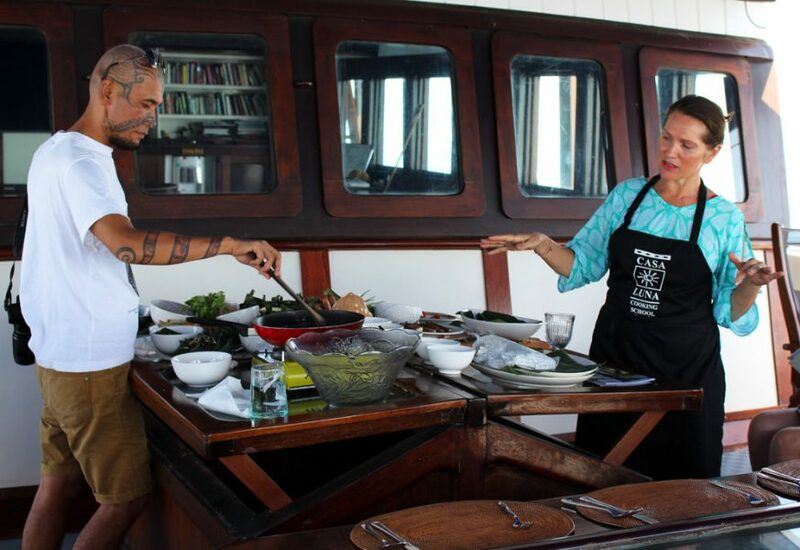 He’s not only a wonderful foodie, sharing his culinary tales from his adventures across the archipelago, he’s a friendly, gentle soul who’s a great ship companion. 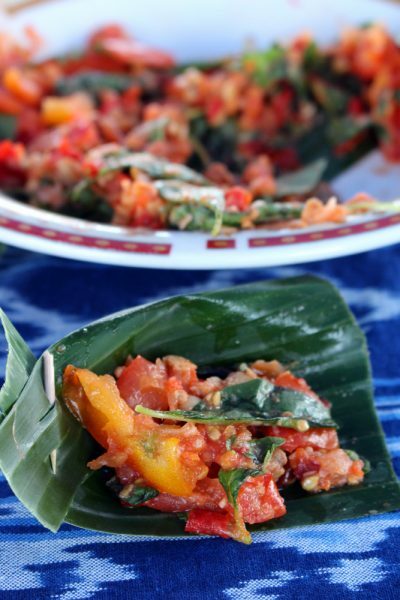 Lunch is again made up of memorable spicy dishes we’ve learned how to prepare ourselves. Dropping anchor, we again whip out the snorkels and masks. A relatively narrow channel separates the islands at Gili Lawa and the resultant tidal Venturi effect causes a strong current near our anchorage. Hence it’s a great spot to see feeding fish and larger sea creatures. There are very few sharks in these waters, the region having been overfished for centuries; only small, very frightened reef sharks are occasionally spotted. Some of us do a drift dive on the current, encountering clown fish, turtles, string rays and many other marine critters as we go. Those who haven’t snorkelled before, do so with the help of floaties and/or lifejackets. All are watched closely by attentive crew milling about in the tenders. While the marine life is rich and a sight to behold, it’s also clear that in this area, more needs to be done to protect the oceans from plastic and refuse. 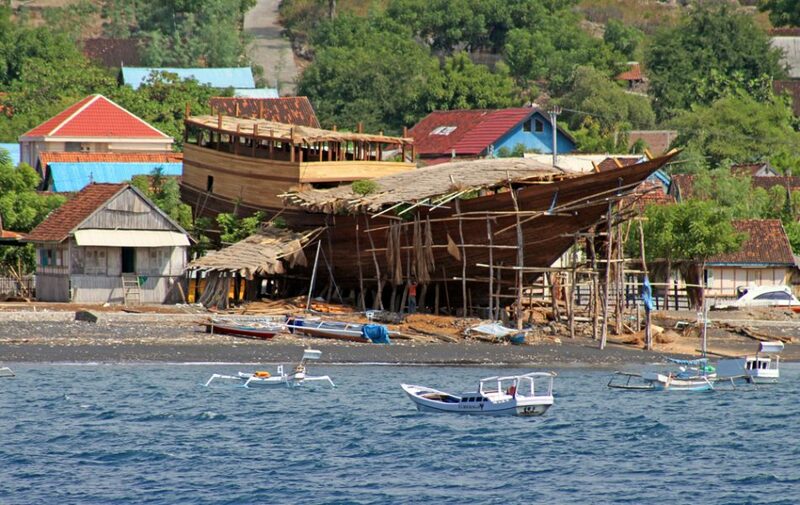 Sadly, even the relatively pristine corners of Indonesia are not immune to this man-made scourge of the world’s oceans. Some of us then return to the boat; he more energetic opt to scale a nearby peak. It’s pretty hard going, often requiring feet and hands on the rocky ascent, but the sunset views at the top are our reward. 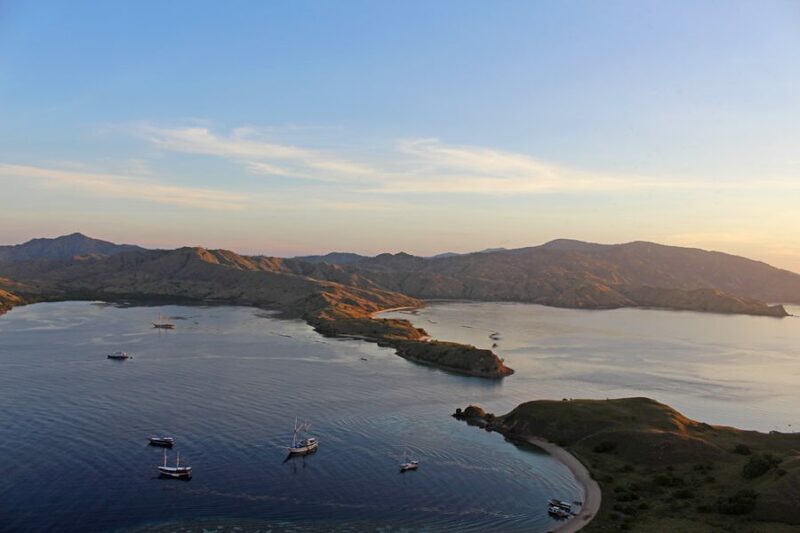 The 360 degree panorama, taking in the Ombak Putih and other boats in the bay, and the islands dotted around us, is breathtaking in the amber evening light. 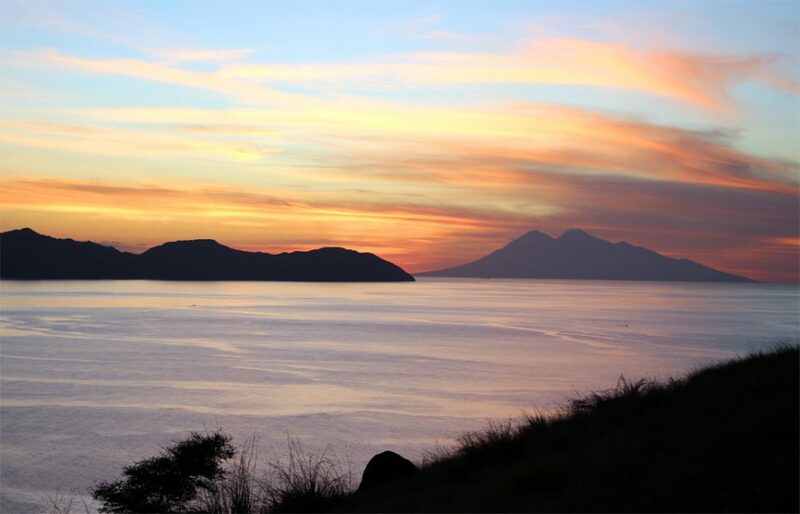 Out to the west is the dark mass of Sumbawa and, to its north, the distinctive conical shape of Sangeang volcano. We really are in a wonderfully exotic part of he world. But it’s starting to get dark, so we stumble back to the beach and out to the boat to join the ocktail-sipping loafers on-deck. As dark descends and the moon rises, our resident photographic expert, Petrina Tinslay shows us more of her wonderful pics – then it’s time to vote for the best photo taken by our group. By now we’ve become a gaggle of gung-ho paparazzi, and the daily competition grows fierce. Rahung then screens a sobering short film he made, about the controversial anti-communist events that wracked Indonesia in 1965. 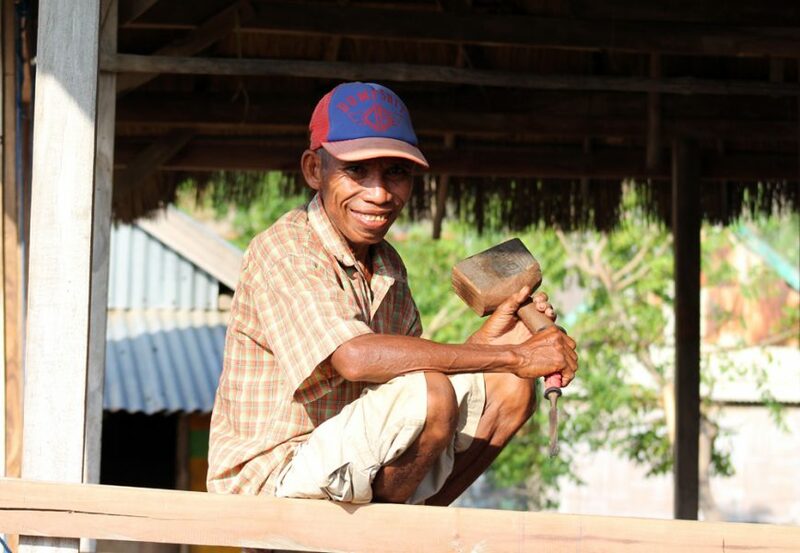 Like many young Indonesians of his generation, he is socially active and keen to enlighten his people. He says his prime purpose is to see a more peaceful and just nation in the years ahead. His documentary is a reminder to us all that the lands around us have not always been as strife-free as they are today. The Ombak Putih cruises west to deserted Banta Island, (between Komodo and Sumbawa). We anchor off a pristine, half-moon shaped beach on Banta’s north coast and head ashore to laze on the beach and check out the undersea world. Pulling up to anchor off Banta Island – a paradise for snorkellers! We see an extraordinary diversity of tropical fish, including a boxfish with a startling resemblance to former PM John Howard – eyebrows and all! For us, this is the pick of the diving spots. The waters are crystal clear, the coral healthy and the fish thriving. We also attempt stand-up paddle boarding – with surprising success. Our dextrous guide Jennifer out-does us all, performing yoga head-stands on the board. Some of the crew and fellow voyagers indulge in bit of skurfing behind one of duckies. A memorable morning in the ocean. The lunch gong only rings once – all that’s required! 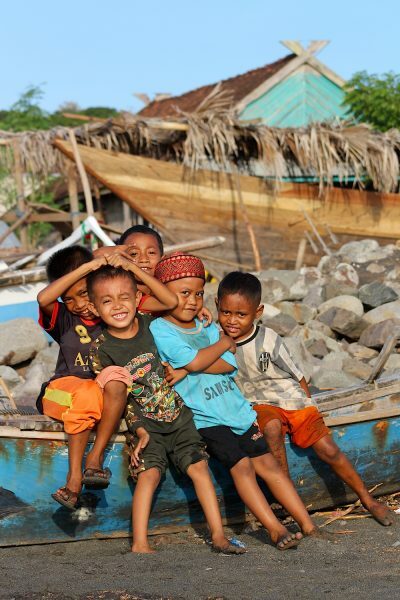 We cruise westwards towards the north-east corner of Sumbawa. 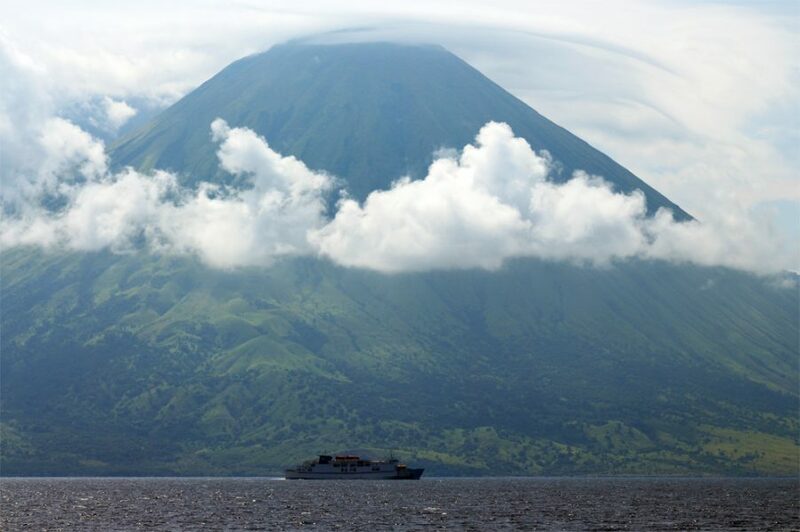 The dramatic outline of the Sangeang Island volcano, which was erupting as recently as last year, looms off the starboard bow. The Indonesian volcanoes are like milestones that dot the island chain from west to east, alluring for their rugged symmetrical beauty and strangely enchanting – at least when they are dormant! The region, ever-changing geologically, is a Nirvana for volcanologists. While underway, we enjoy another tasty lunch before arriving at the small boat-building village of Wera. 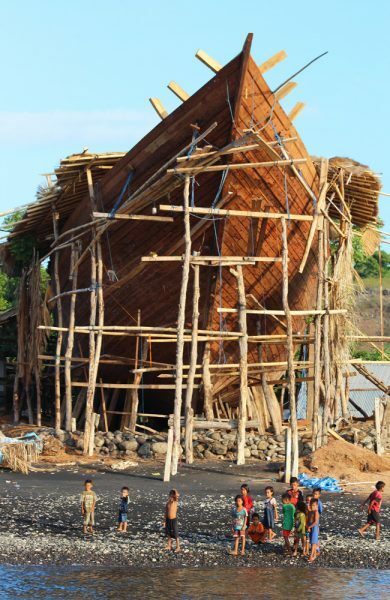 Coming ashore, we spot the locals’ latest construction effort, an astonishing, enormous wooden craft cloaked in bamboo scaffolding, dominating the beach. This baby gives Noah a run for his money! The design and construction of such craft hasn’t changed for centuries, primarily because these Bugi vessels are nigh perfect for sailing the trade routes. Ashore we check out this ‘Sumbawan ark.’ Workers busily scramble over it sawing, hammering, planing, nailing and corking. These craft take many months to build and very few precision instruments are used. The curve of the hull is calculated by eye and experience only – and they never get it wrong. When completed, the boats are launched from the beach on the highest tide of the year, accompanied by great ritual and ceremony. 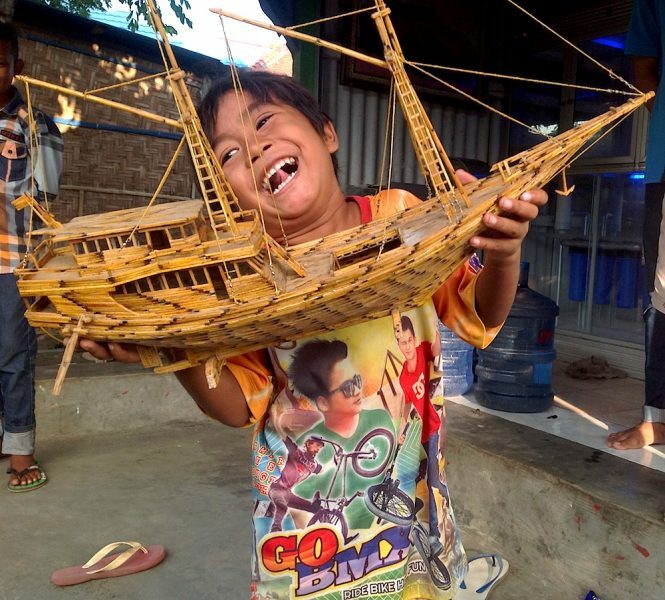 We’ve seen boat and ship building at a few places around the world, but Wera village is certainly the most memorable and impressive. The group take a toddle around the Muslim village. The people of Wera are also known for their fine weaving, and women emerge from brightly coloured houses to show off their wares. We are followed by herds of giggling and chattering kids, who clearly don’t see many sweaty Caucasians in Hawaiian shirts wandering their streets too often. The little scamps essay the odd sale of whatever is at hand, but are mostly just very entertaining and full of mischief. No need for an ipad or X-Box game to keep these lively ones preoccupied. They seem genuinely sad to see their lumbering visitors go and energetically wave us goodbye from the beach. 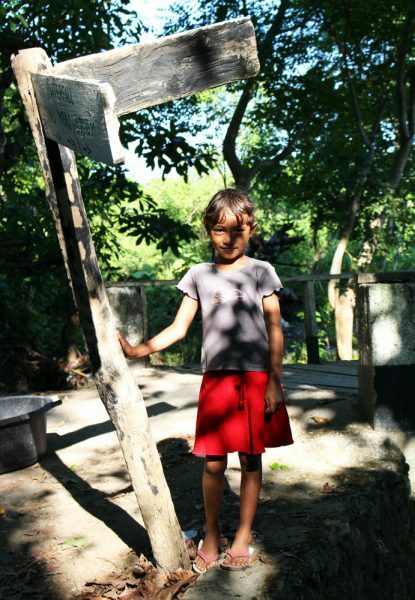 It’s touching to witness such strong traditions and village customs alive and well in eastern Sumbawa. Then it’s back to the boat for cocktails and dinner. The captain points the Ombak Putih’s prow west into the setting sun. After dinner Jacqui wins the day’s photo contest, defying the critics and fending off cries of “rigged” emanating from some less charitable quarters of the salon. A new Margaret Burke White is born! 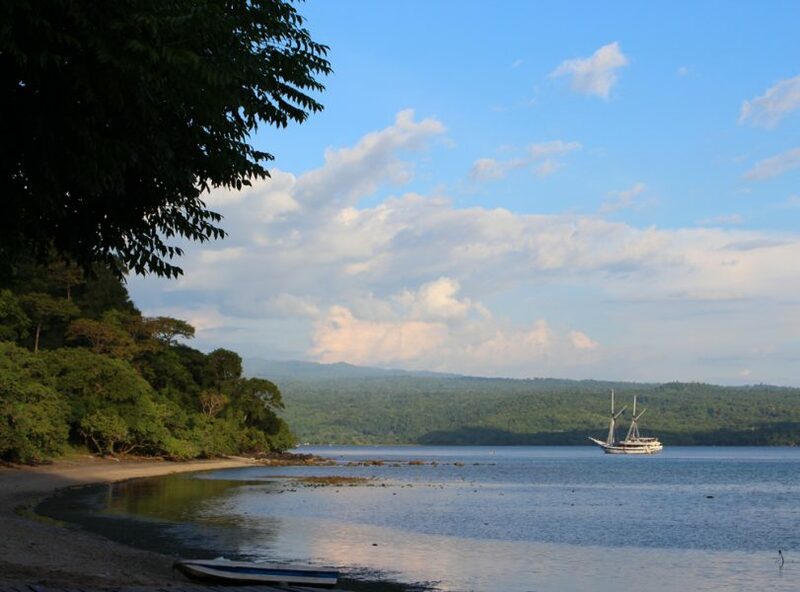 We sail the length of Sumbawa’s north coast through the night to our next destination. Overnight, we’ve passed what remains of the Mount Tombora volcano. The cataclysmic 1815 eruption of Tambora was one of the most powerful in recorded history, far exceeding the more famous Krakatoa event to the west. A large portion of the Sumbawan population was killed by the eruption. It blew most of the top of the mountain to bits and now the mound-shaped lower section is all that remains in the landscape. The eruption column lowered global temperatures; some experts believe this led to planetary cooling and worldwide harvest failures, or what became known as “The Year Without a Summer” in 1816. It also led to various cases of extreme weather around the globe, and arguably altered the course of history. We’re up early for a cuppa on deck to take in a new shoreline in dawn’s golden light. By 8am we’re boating across to Moyo Island. It feels like the most isolated place in the world, which is perhaps why the likes of Princess Di and Mick Jagger have both found their way here. 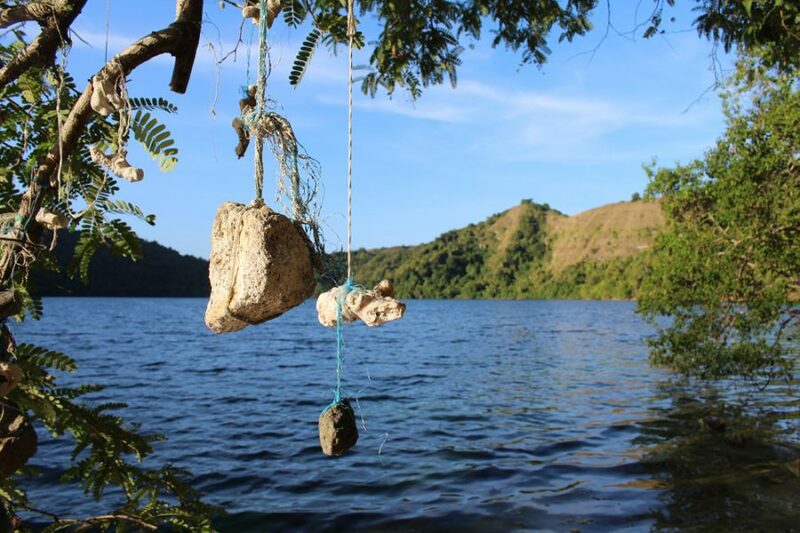 As with much of Sumbawa, madding tourist crowds and tacky commercialism hasn’t arrived yet. Hopefully it stays that way. We arrive at the tiny seaside village of Labuhan Aji. 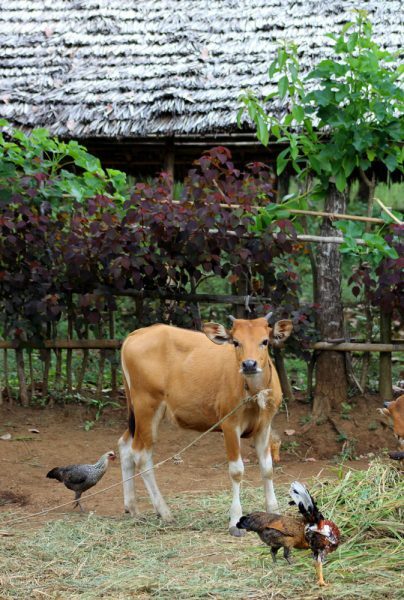 Led by our Indonesian tour guide, Anastasia, we follow a track past bleating goats, peering locals, and women washing clothes in the streams. After a kilometre or so the trail leaves the village and farmland and we are surrounded by jungle. 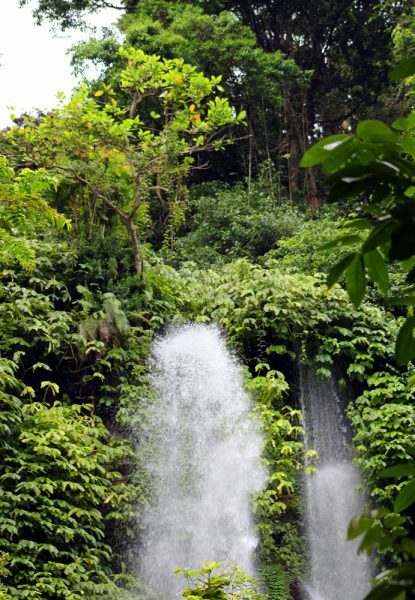 Twenty minutes on, we’re at the Diwu Mbai waterfall, a popular with young locals. 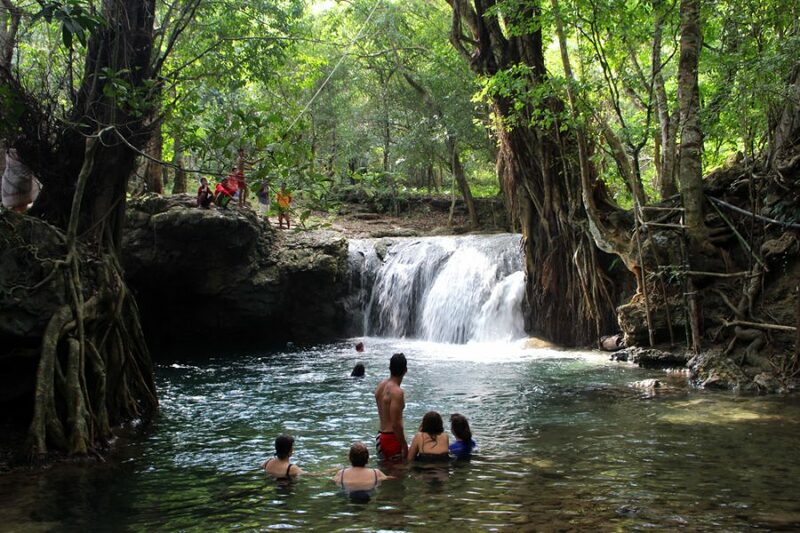 It’s a beautiful sylvan location with tumbling cascade bathed in dappled light, a cool-water swimming hole shaded by ancient trees. 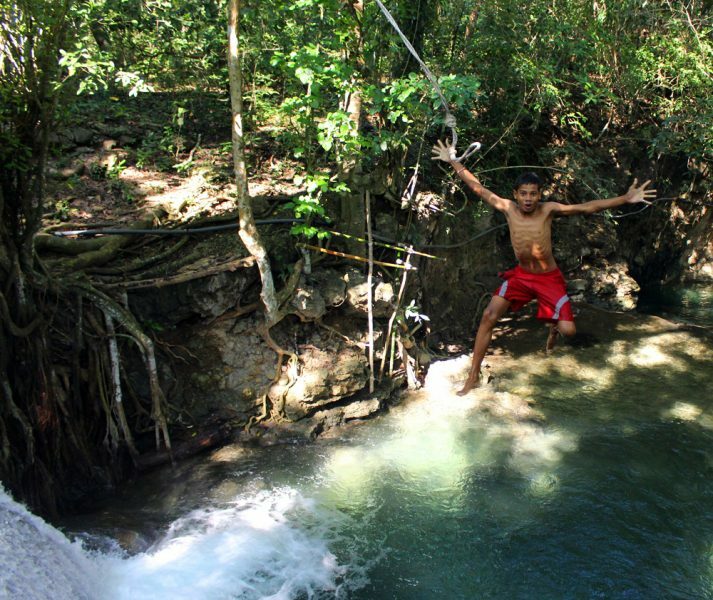 Friendly teenagers are showing off, demonstrating how to swing, a la Tarzan, on the rope from atop the falls, splashing into the pool below. Pete tentatively gives it a whirl, and though his acrobatics are far from Cirque De Soleil, he manages a clumsy belly-flop, leaving him a tad sore in certain parts for a few days. 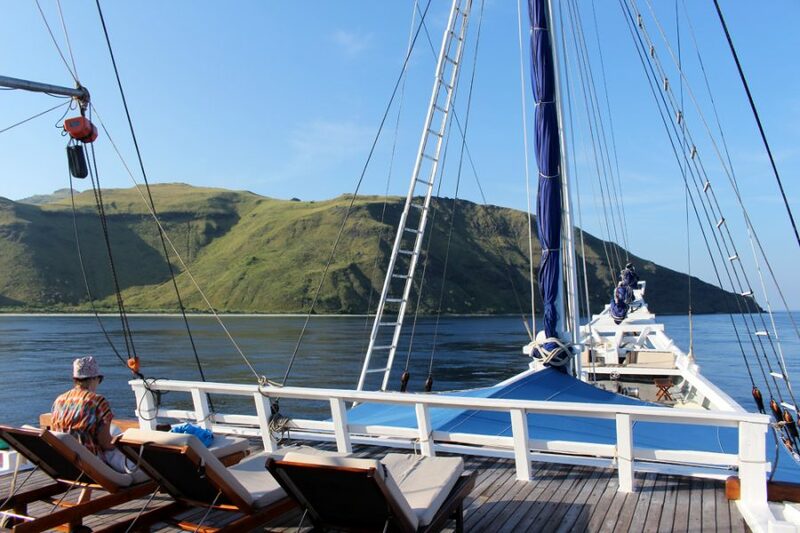 Later our vessel moves to nearby Satonda Island, just off the north coast of Sumbawa, famous for its striking saline crater lake set in the remnants of an extinct volcano. After more fine snorkelling, we head 400 metres uphill to the crater’s lake to bask, very buoyantly, in the warm salty waters. Small black fish nibble at our skin – similar to those you find gobbling tourists’ revolting extremities at cheesy beauty parlours in Bali. Somehow, though, the whole process seems more natural in this pristine lake. Beside the lake is a “wishing tree.” It’s said that if you tie something to the tree and make a wish, it will eventually come true. Hence the local herbage is festooned with every imaginable object from plastic bottles to cigarette packets. Hopeless cynics that we are, we still find ourselves adding our token piece of coral to the boughs. In the evening, we’re back on shore for a beach barbecue, buffet and bonfire revelry. The crew lays out the feast, serves drinks, and plays music as we kick up the sand dancing. Anastasia sings a beautiful solo song about the former troubles in her native Ambon. Even a member of local constabulary, drawn by our bonfire and raucous singing and dancing, motors over from Sumbawa to join the fun. He cracks a Bintang and settles in for the shindig. “That was so much fun – one of the best nights I’ve ever had in my life,” Bonnie, a passenger from the Gold Coast, later confides. 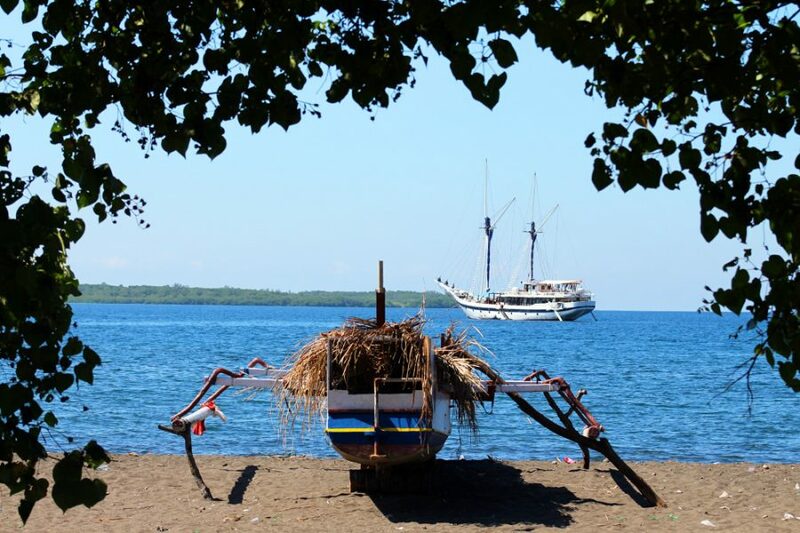 Overnight, we sail along Sumbawa’s north coast and across the straits to the neighbouring island of Lombok. 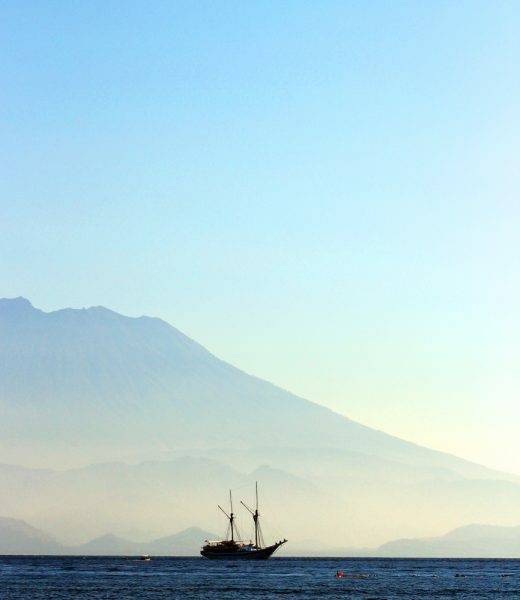 As dawn’s sun illuminates the boat, we find ourselves anchored off the village of Senaru, Lombok. 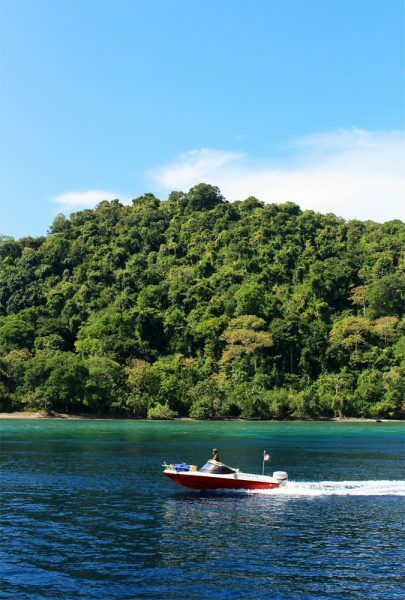 Some of us head to shore for an hour’s car tour through lovely coastal countryside, then inland to Wetu Telu village, home of the Sasak people. 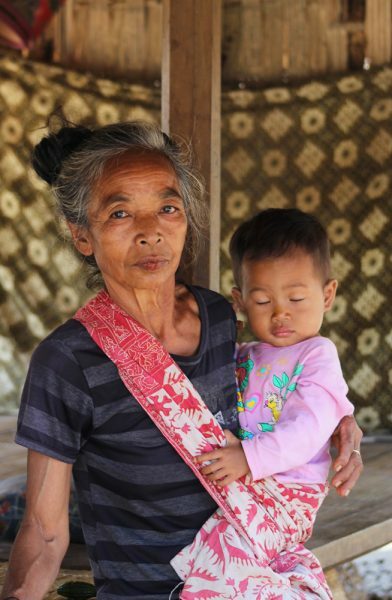 The indigenous Sasak maintain customs shaped by animism, Buddhism, Hinduism and Islam and are unique in the archipelago. 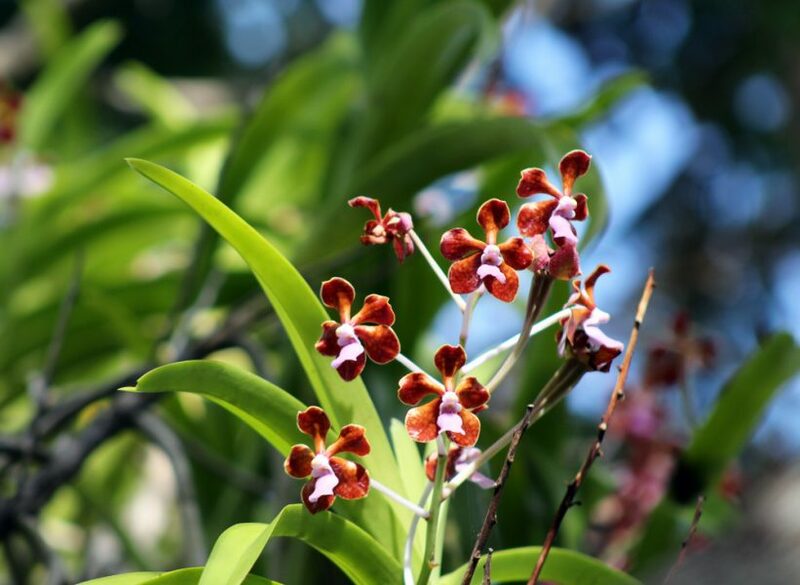 Their ancestors are said to have arrived in Lombok from the Malay Peninsula around 100 BC. 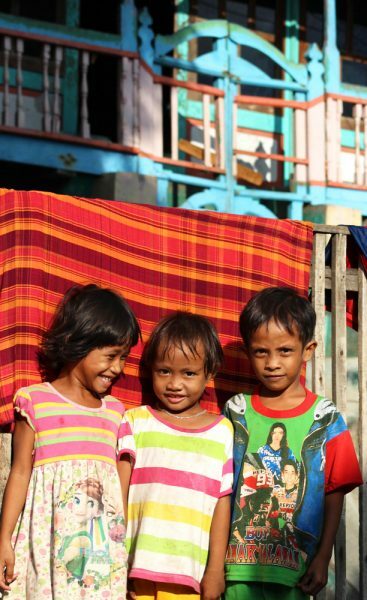 Today they make up 85% of Lombok’s three million people. Their language, religion, architecture, dances and music are a fascinating amalgam brought here over the centuries by sailors, conquerors, artists, political outcasts and religious missionaries. Here an all-female team of guides shows us through a small, historic rural village and its market gardens. In their tiny huts, the locals are still living modestly and adhering to ancient rituals. Even though they are primarily Muslim they continue many of their rites and occasionally even make animal sacrifices in the crater of nearby Mount Rinjani, which dominates the landscape of northern Lombok. “Here’s where the woman washes her husband’s feet, then splashes her face with the water,” says our guide. Each to their own. 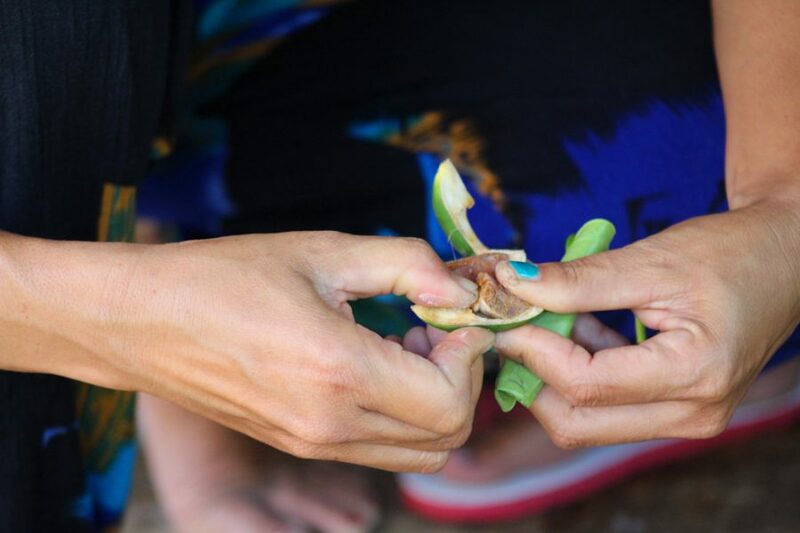 Chewing the ubiquitous betel nut, we tour the Sasak market gardens, bursting with tomatoes, cacao, onions, turmeric, jackfruit, black beans, cotton, and many other vegetables and fruits. 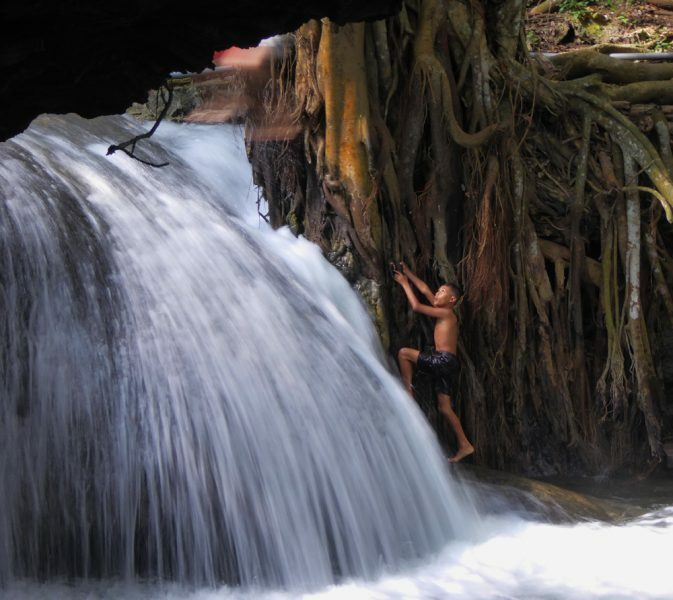 Some of us even trek further to see the spectacular Sidang Gila waterfall, and a local mosque. 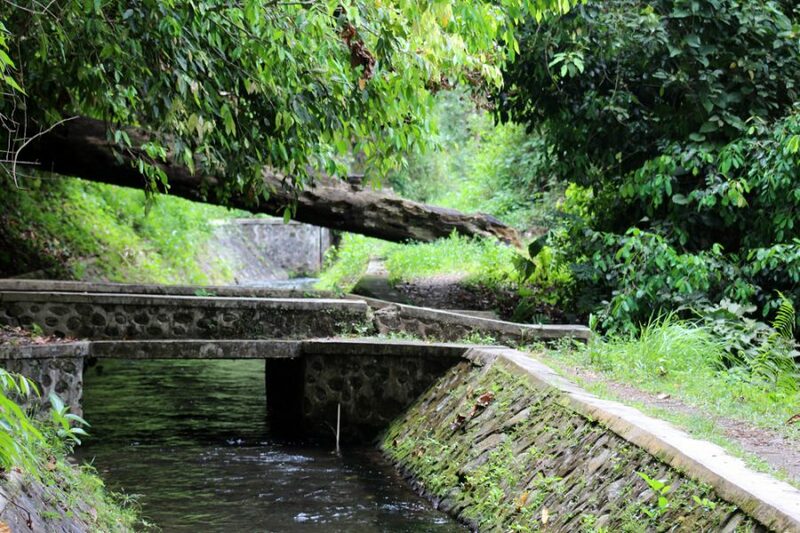 In the valley near the waterfall we are shown a remarkable irrigation system, built by the occupying Japanese during World War II. Using slave labour, the Japanese made the people burrow out a channel in the sheer cliff face to supply water to the rice fields in the lowlands. Hundreds died from maltreatment during the construction, but the channel is still in use today. Then it’s back to the boat for lunch and a final, glorious afternoon snorkelling in the still waters off nearby Panjang Island. On our last evening, we tuck into our last delicious feast and Petrina screens more photos, including our final entries in the nightly contest. There are many laughs at dinner, as at this stage of the trip we all feel comfortably familiar with each other. After all, by now some of us are sleeping together – choosing to lie up on deck under the brilliant Milky Way and galaxies rather than in our cabins. “We’re true seafarers, me hearties!” someone blurts in the dark. The Ombak Putih motors though the night towards Nusa Penida and its little sister isle, Lembongan. We cross the Wallace Line on this run (that faunal boundary drawn in 1859 by British naturalist Alfred Russel Wallace, separating the ecozones of Asia and Australia). Basically, the fauna to the west of the line is very different from that to the east. The separation is primarily caused by the straits separating Bali from Lombok, which has little interchange of birds and land animals. A diminutive tender comes out to fetch us en masse, and maybe it was all that Nasi Goreng or Janet’s wonderful homemade bread (couldn’t be excessive Western dietary habits), but we are almost taking water over the gunnels as we putter to the settlement – barely avoiding turning turtle and going to the seaweed beds below. We inform him that nowadays the same tedious fate also awaits most Australians, but our gondolier is too busy poling us through raging tidal rapids to commiserate. 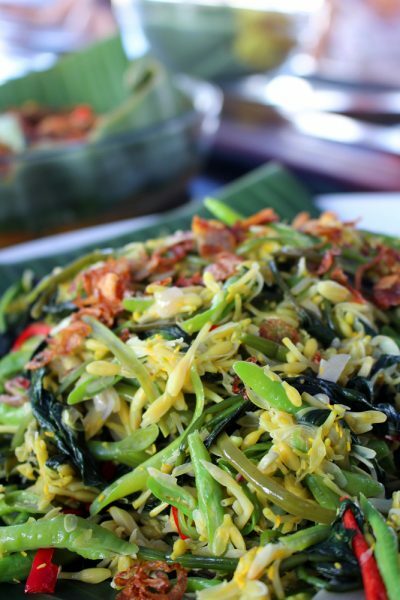 Lembongan mangroves – very ‘Africa Queen’. 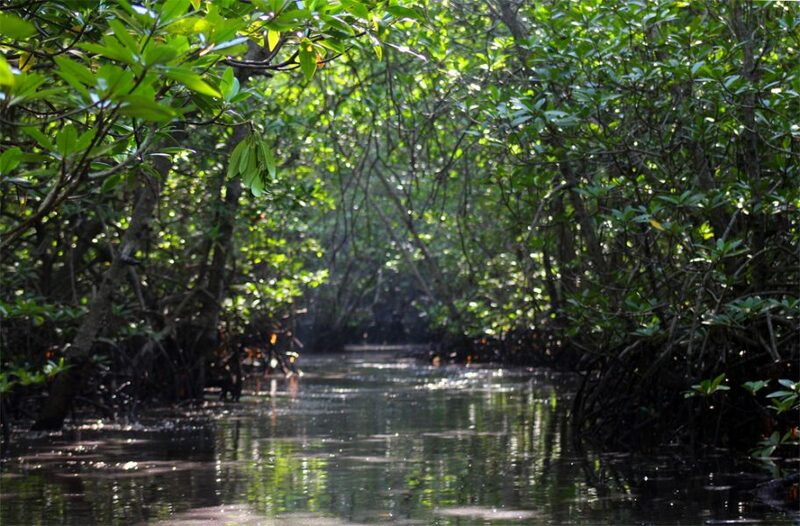 We glide through the peaceful coastal mangroves, feeling like we’re in a scene from The African Queen. It is wonderfully quiet and relaxing in the dense swampy vegetation. Back on land, we meet a local seaweed farmer who tells us business is dreadful – his product, used in cosmetics worldwide, now only sells for three dollars a kilo. It seems the weed is also being affected by rising water temperatures and pollution. 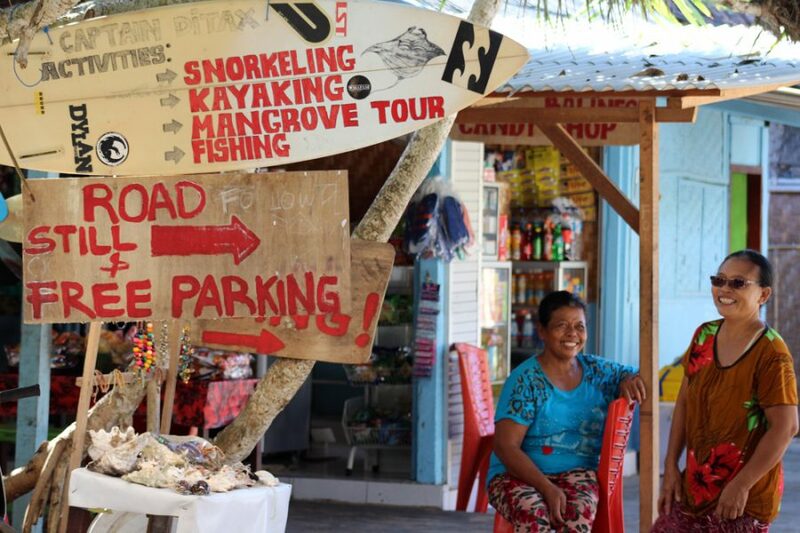 Thankfully the locals are resourceful; many sell everything from seashells to soft drinks, catering for the hundreds of tourists who visit daily from Bali. We moon around on-shore a little longer, buy a few trinkets, including an alluring necklace fashioned from what looks like tubes of coloured sea shell, but turns out to be little cylinders cut from one of Baron Bic’s biros. But hey, they look damned fine against our nut-brown seafaring chests and décolletage. 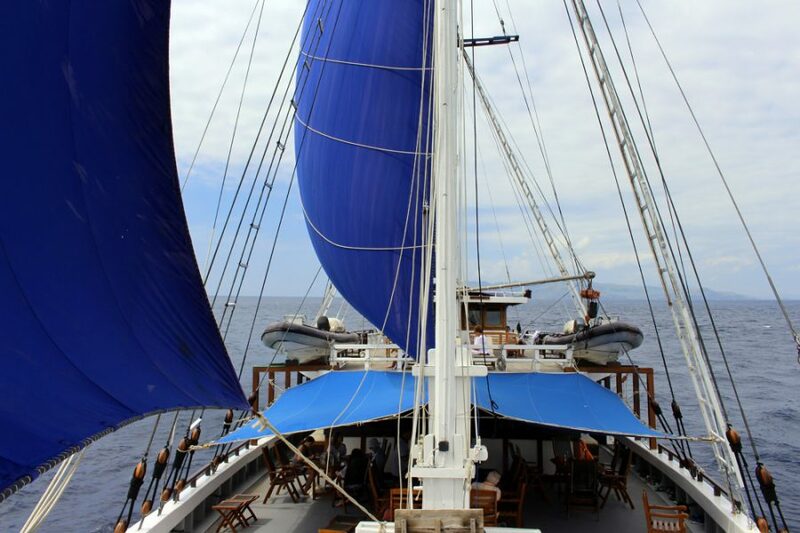 Then it’s back to the boat for the final run with the trade winds across to Bali. Sadly, our seven-day adventure is at its end. We steam into Serangan Harbour, Bali. A squad of taxis and vans await to take us to our respective destinations. 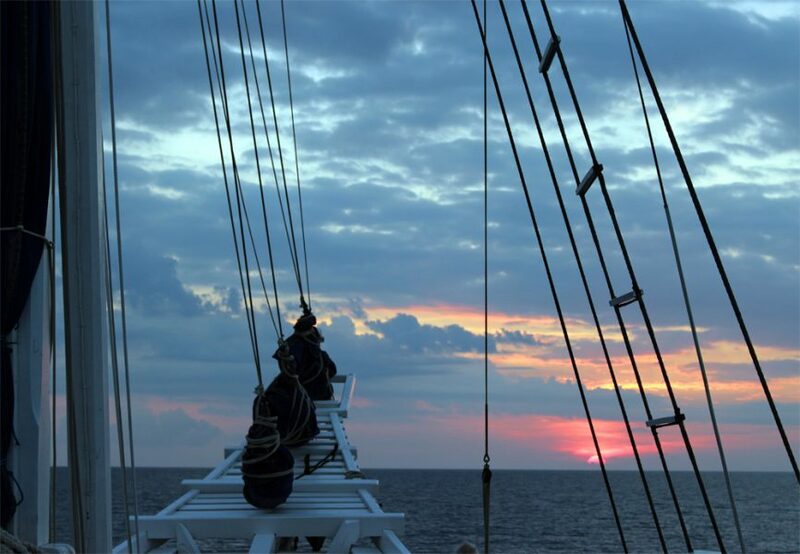 We feel a little moist of eye as we bid our fellow voyagers, and the crew, au revoir – exchanging emails in the hope we may meet again some time…ideally back here, very soon! Sea journeys are terribly romantic, full of adventure and discovery, so it’s hard not to be a little mopey when you leave new friends and disperse to places far away. 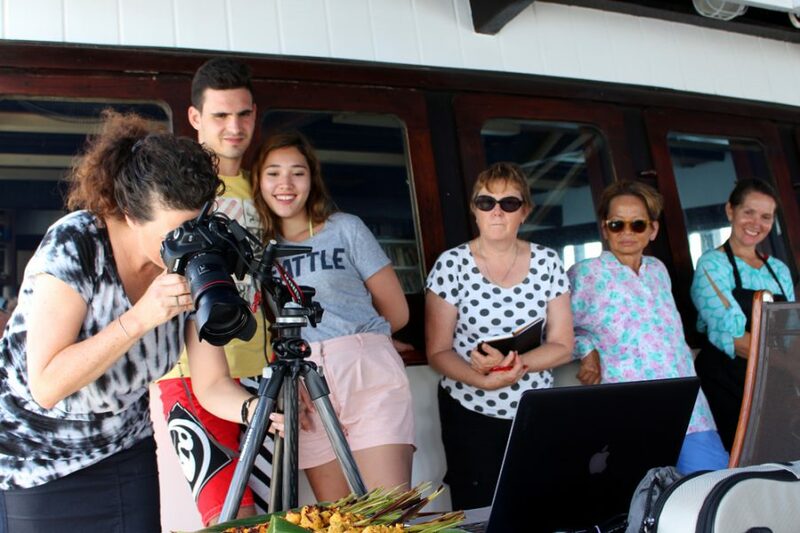 It’s been a terrific trip: great food, fine snorkelling, brilliant wildlife, charming people and cultures, enlightening culinary and photography lectures, and spectacular scenery. 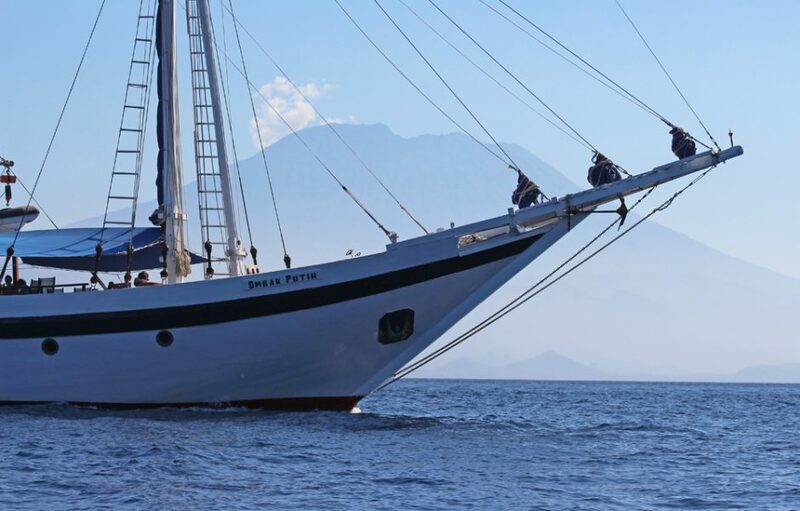 Above all, the cruise aboard the Ombak Putih was a great opportunity to explore the rarely visited parts of the incomparable Indonesian archipelago. 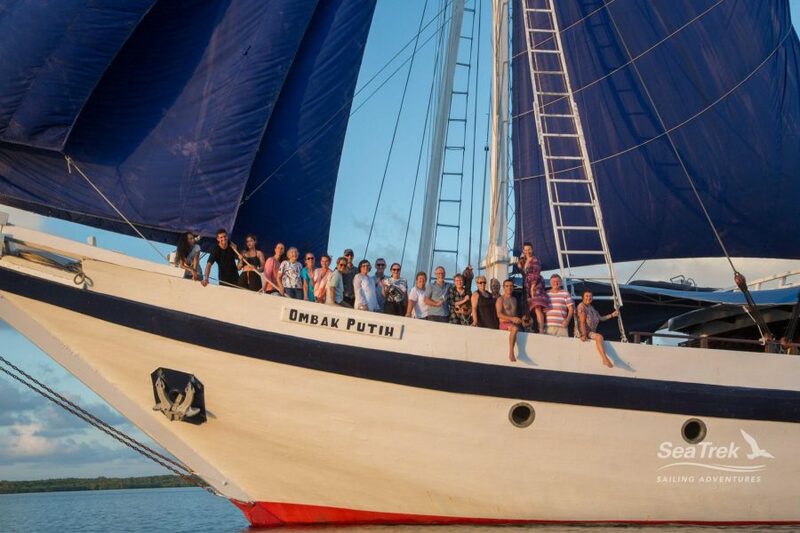 SeaTrek runs voyages like this throughout the year: its website provides information about upcoming tours, many including experts aboard (historians, biologists, authors and other knowledgable folk) enhancing the journey with their wisdom. Give it a go – there’s a cabin with your name on it! Starfish Photographs: Peter Rigby. Many thanks for the contributions by the photographic competition winners.